Getting approved for a merchant account if you have poor credit or a bankruptcy. It's important to understand that every bank has its own approval criteria and different views on the risk associated with a merchant that has filed for a bankruptcy. Always remember that what one bank considers high risk, another may be happy to accommodate. It's one of the reasons why we work with a number of acquiring banks. Credit card processing is not a "one size fits all" industry. With the understanding that each bankruptcy must be assessed with on a per case basis, we must look into the criteria surrounding each individual bankruptcy. You must first separate the conditions of the bankruptcy. For example, was it because of some type of intentional wrongdoing or shady business practices, or was it because of personal reasons that wouldn't carry over into operating a business? Has the bankruptcy been discharged, or are there still a laundry list of upset creditors? No matter how you slice it a bankruptcy is not desirable, but there are certainly shades of grey within a bankruptcy that will have a differing impact on approval of the application. Depending on the conditions of your credit history or bankruptcy (such as how recent the bankruptcy was) there may be certain conditions attached to the approval of your account such as a rolling reserve or processing limit. If you are wondering why a processor would want a rolling reserve and how risk works in the payments business, you can find it being discussed in this blog posting. In many cases the goal is to get through the door and get approval with a mutually agreeable security reserve, and to build your track record and prove yourself by maintaining your account in good standing. If you can do this you can renegotiate any conditions attached to your approval and eventually eliminate them (usually after at least 6 months, possibly a year). Get your money back if you get declined! An important point to get clarification on before choosing your processor is whether your merchant account application fee is if it's refundable in the event your application is declined. At Merchant Accounts.ca this is standard policy. (Full refund if application is not fully approved). This is especially important to confirm if you have poor credit or a bankruptcy in your credit history. As a final note on approval, you should realize that there are many factors besides personal credit history that will be considered during the application review process. Factors such as the risk associated with the product or service your business offers, monthly processing volumes, average transaction size, fulfillment timescales (how long it takes to ship your goods to the customer) and many other criteria are considered. Your processor should want to approve you. 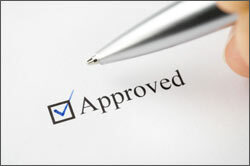 At the end of the day, it is your merchant account providers job to help you achieve approval and start processing. Some providers work with only one bank, and this is not desirable, particularly if you have poor credit history. Also be aware that some processors could have a flat decline policy on anyone that has had a bankruptcy in their credit history, so it's best to confirm this before applying. At Merchant Accounts.ca we are generally happy to work with folks that have had a bankruptcy, so long as it's discharged and in reasonably good standing. On a personal front, my best advice is to be honest, upfront, and choose a provider that can work with you to make the best of the situation and help you achieve approval on the best terms possible. Underwriters are not machines, they are people too, and if you can be forthcoming and appeal to them in a decent, honest and upfront way, that is the best recipe for success. I've personally with dozens of clients that have had a bankruptcy over the past 10 years, and in the majority of cases the end result was a successful approval.